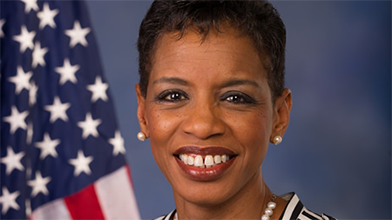 Congresswoman Donna F. Edwards represents Maryland’s 4th Congressional District, comprising portions of Prince George’s and Anne Arundel Counties. She has championed efforts to protect and strengthen Social Security and Medicare, defend women’s rights, expand economic opportunity for women, raise awareness of domestic violence, and get unlimited money out of politics. She was the first to introduce and champion a constitutional amendment to overturn the Supreme Court’s Citizens United decision.